Dubai, October 26, 2013: The first-ever consumer-focused India luxury show got underway at the Jumeirah Beach Hotel in Dubai on Saturday with a strong attendance of leading members of the UAE's society and corporate world interesting in exploring luxury experiences out of the world's second most populous country and fourth biggest economy. Royal India-2013 Luxury Show is expected to be visited by over 3000 by-invitation guests - High Net Worth Individuals (HNWIs) and other wealthy Emiratis, Arabs and Indians - over its three-day run. The show, supported by the Indian Ambassador to the UAE and India's Ministry of Tourism, is being held with Gitanjali Group as Presenting Sponsor and Century Financial Brokers as the title sponsor. His Highness Sheikh Mohammed bin Juma Al Maktoum, accompanied by the Indian ambassador to the UAE, His Excellency M.K.Lokesh, and other dignitaries, formally opened the debut edition of the show by cutting the ceremonial ribbon in the presence of a large number of government officials, businessmen, investors and media representatives. The show, along with a gala dinner on the first day, is attended by high-flying investors, high-profile government officials, corporate honchos, celebrities, socialites, art connoisseurs and members of rich families of Emirati and Indian communities. Being held on a total exhibition space of 21,000 square feet, the show has a significant number of hand-picked exhibitors from India, specializing in luxury products, services and experiences in a travel, shopping, arts, lifestyle and wellness. The CEOs of reputed organisations from various economic sectors of India and the UAE will be attending to explore business opportunities and corporate tie-ups. The exhibitors have been able to replicate a slice of their bouquet of luxury offerings through fully-furnished Luxury Stands, each with a built-up space of 25 square metres -by far the largest size provided to exhibitors in any country-focused trade exhibition. The organisers selected Dubai for the launch of the luxury show considering its eminence as the Arab world's luxury hub, accounting for 30 per cent of the Middle East luxury market and around 60 per cent of the UAE's. According to the recently-released Hurun India Rich List, nine percent of India's super rich reside in Dubai. The UAE features sixth on the global ranking for a per capita income of $47,500. At $360 billion in 2012, the GDP of the UAE ranks third in the Middle East and North Africa (MENA) region. According to the recent VISA Affluent Study-2013, Emiratis belonging to the affluent socio-economic class give equal priority to dining out, leisure and expenditures on family holidays. The study revealed that the UAE was ranked fifth among the surveyed countries in terms of individual plans for future discretionary spending on holidays. Concerning family holiday trips over 90 per cent of Emiratis took an overseas holiday in the previous year and plans to travel again in the coming year. 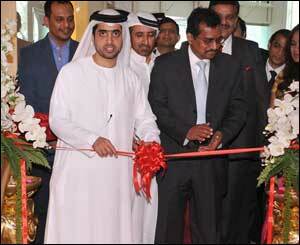 India-UAE relations are growing stronger each passing year with annual bilateral trade exceeding US$75 billion. Last year, an estimated million Indians visited Dubai, adding up easily another five billion dollars to the bilateral trade. Every 20 minutes, an aircraft takes off between India and the UAE. She said it was perhaps for the first that the �luxury' facet of India in tourism, hospitality, holidays, shopping, lifestyle, and other domains was being done in the Arab world for people looking for exclusivity, luxury and style. According to the Indian Ambassador to the UAE, M.K. Lokesh, the travel between the two countries was driven by necessity such as business, work, education and medical treatment, but luxury has emerged as a new dimension to this relationship. The show, he said, endorses the global vision to showcase India as a world-class platform in tourism, travel, hospitality, infrastructure, technology, and service industry sectors such as healthcare, wellness and education. Mr. Parvez Dewan, Secretary at the India's Ministry of Tourism, pointed out that Royal India Luxury Show will create conducive environment that further enhances the luxury tourism sector in India at a global marketplace and Middle East, particularly the UAE. The exhibitors have utilized the show to highlight their offerings to the selected invitees in a broad range of luxury products and services. Gitanjali Group is showcasing leading diamond jewellery brands in the world such Nakshatra, Gili, Asmi, D'damas and Diya. Aamby Valley City, India's first planned hill city, is participating to amplify the brand to the affluent UAE residents. Sahara India Group has also joined in the efforts by highlight its luxurious offerings at the Sahara Star hotel in Mumbai which boasts the world's largest pillar-less clear-to-sky dome of its kind and world's only private dining room amidst India's largest marine aquarium. Soukhya is seeking to tap the Middle East market for the first holistic healing centre of its kind in the world, located in Bengaluru and run by Dr. Mathai. Violet, the world's first completely wireless surround sound system, is also being showcased at the show, drawing huge response to the visitors. Maharaja Express, the owners and operators the best luxury train in India, is using the show to bring the luxury journey packages to the regional markets. It is promoting luxury tour packages on its trains starting from $3,850 per person on a twin-sharing basis. Maharashtra Tourism has unveiled the royal facilities that await the visitors in this western Indian state, specially the luxury train journey by Deccan Odyssey. Also participating are India's top fashion designers, Satya Paul and Rohit Verma. Available on hand at the show are experts from India's national and regional tourism organisations, luxury travel companies, luxury properties, luxury hotels and resorts, luxury healthcare and wellness and representatives of educational institutions designed for high-end students. Next Story : Amira Haroon @ Fashion Forward.